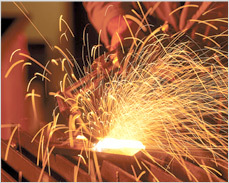 Welding blankets are used to protect human beings, materials and equipments from welding splatters/sparks produced during the process of welding. Blankets are also used to protect surroundings from heat during gas cutting and gas welding. 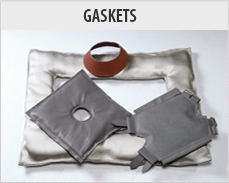 Welding blankets are made from Glass fabrics, High Silica fabrics and Ceramic fabrics. Glass fabrics with Vermiculite coating are also available. These blankets can also be provided with loops for hanging or with eyelets. Cable Protection Sleeves are used to protect cables and hoses from high heat, molten metal splashes, occasional flames in nearby areas. These sleeves are made from Heat Resisting fabrics. 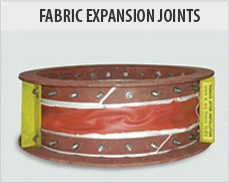 The sleeves are also made to suit particular size of cable or hose that are already installed at customer’s site. The sleeves are generally made from Silicon Rubber Coated Glass Fabrics. For higher temperatures, High Silica Fabrics and Ceramic Fabrics are used. 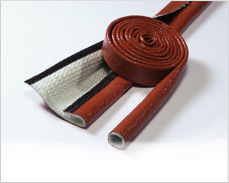 Cable Protection Sleeves can be supplied with Velcro, Steel Buttons or can be Stitched at site so that they can be fitted on cables which are already connected in the system. Such methods of installation bring extra convenience. At many areas in Industry, valves are insulated by using insulating wool and cladding the same with aluminium sheet. During maintenance, this has to be dismantled which is time & material consuming. To avoid this, Urja has introduced Removable and Re-usable Valve Jackets. 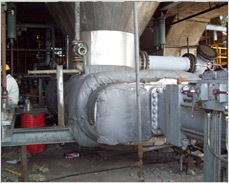 Valve Jackets are made by inserting Insulating material (generally wool) between two layers of fabric and stitching the whole unit with high temperature threads. Generally strings are provided for easy fitting and removal. Thickness of insulation will depend on the surface temperature of the valve. They are easy to install; They are easy to re-use & re-fit; refitting saves Cost/TIME & they work in all weather conditions. 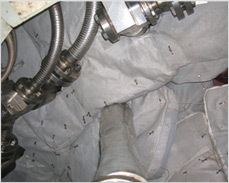 The surface of some Gas Turbines, are insulated by using pillows made from Heat Resisting Fabrics and insulating wool. Fabric used is generally Glass fabric with SS wire woven into it. Insulation used is generally Ceramic wool blankets of heavy density. Pillows/pads are made from above material and are stitched with Heat resisting threads to fit the contours of Gas turbine. These pillows are fitted like a jig-saw puzzle to take the shape of turbine surface. Each pillow/pad is placed next to each other by using lancers through which SS wire is passed for secured fastening. 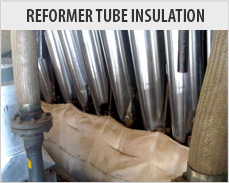 Above insulation is removable and reusable in nature thus saving TIME / COST. Urja is authorized distributor of NEXTEL products manufactured by 3M of USA. These are chopped fibres, tapes, sleeves, yarn & fabrics. These are Ceramic Textiles suitable for extremely high temperature thermal insulation applications at 1300 º C. for insulation for Reformer tubes, high performance polymer composites, aircraft panels, structural components, Heat-shields, door-seals, furnace lining etc.